Grrr, we are backlogged again, so get ready for the worst reviews ever! YEAH for laziness!! I said I wasnt going to eat Kemp's frozen yogurt anymore, but man I am hungry and I am like +11 pounds so I gotta find something to cure my ice cream cramps. So, I decided to pick up the very low fat Kemps strawberry frozen yogurt. The great thing about strawberry is that even though few get it right, overall it's pretty hard to mess up. That's actually not a bad first slice of an ice cream. I see real strawberry bits scattered throughout and even a few big bits. It's got a typical pink color and it appears to be fairly standard fluffy but not wonky texture. I dig in and immediately I am questioning myself. Either something is wrong with either my tastebuds or my brain because I swear I taste cheese in this product, and it's not the first time either. There is something is certain flavors that makes me thing cheese and it drives me nuts. That being said, that cheese twang does subside, though I wish I had a better word to describe it. It's not that it tastes like cheap vanilla froyo, it tastes like... uggg, yeah, I don't know any words that imply cheese. The good news here is that at 3% fat (5% sat fat), I can scoop a bowl and my ice cream urges will be put away for the night. The only downside is that I don't really want strawberry every night, though I guess I could sprinkle a cookie on top maybe. So, we're going to call this one ok and probably the best one I've tried since Kemp's Moose Tracks froyo. 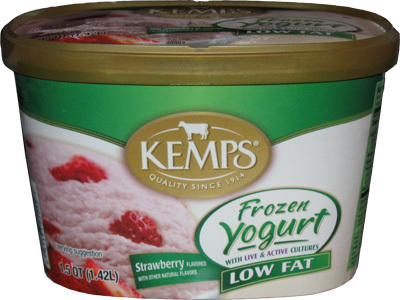 where can I buy Kemps low fat or fat free yogurt? Kemps is a midwest company, so they branch out from there. Just try to hit a few different chain stores and you might get lucky. 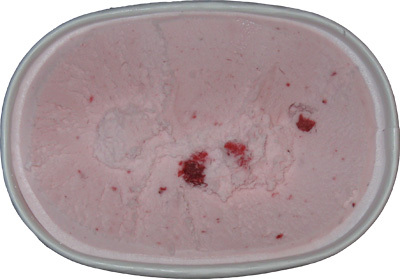 The fat free strawberry frozen yogurt is really REALLY good!